Over 326 applications have been made to the Domestic Violence and Abuse Disclosure Scheme (DVADS) in Northern Ireland, since its introduction one year ago. The scheme, operated by the Police Service of Northern Ireland, in conjunction with statutory and voluntary partners, allows a potential victim to receive information on their partner’s history of abusive behaviour in terms of the risk they pose, enabling them to make an informed choice about their relationship. Anthony Harbinson, Director of the Department of Justice’s Safer Communities Directorate, said, “I welcome the take up of the disclosure scheme and the courage of those coming forward to make an enquiry. 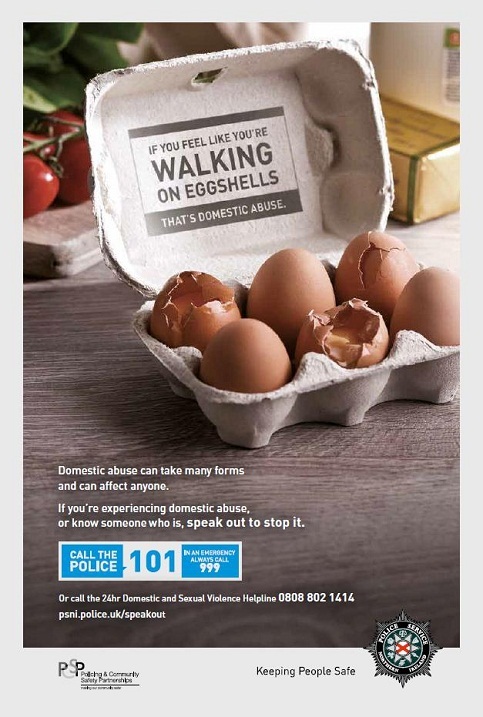 “Domestic violence and abuse is a serious problem within Northern Ireland’s society and we remain committed to tackling it through implementation of the joint Department of Justice and Department of Health seven year strategy. “I am also encouraged by the proactive steps being taken by police and partner organisations in making their own enquiries through the scheme. “We will continue to work in partnership with PSNI and our statutory and voluntary sector colleagues to help create a safe community where we respect the law and each other,” he added. Discussing the first anniversary of the Domestic Violence and Abuse Disclosure Scheme, Detective Superintendent Ryan Henderson from Police Service Public Protection Branch said, “I am extremely proud that we now have this Scheme in place across Northern Ireland. “The Scheme is different because it focuses on preventing people from becoming victims. Abusers can often move from relationship to relationship leaving a trail of abuse which the Scheme stops from remaining hidden. “One year on from the launch, I am pleased to see the uptake in the number of people who have come forward to apply. This has surpassed our expectations and shows the Scheme has a vital part to play in tackling domestic abuse. “My message one year on is that the Scheme works and I would encourage anyone who feels that it is right for them to use it,” he added.